3D printing is becoming more and more popular in aerospace technology. During the past couple of months we’ve observed countless parts being 3D printed. They are not just prototypes, but can really be used in space. You may have heard of the 3D printed parts of satellite. When it comes to aerospace innovation, NASA can’t fall behind. They have already been widely using 3D printing, and they have recently revealed that they have created a part of rocket engine that can be used in terms of space program. 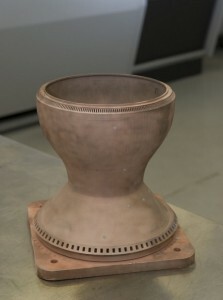 This part is a combustion chamber liner made of copper. Thus is the most important part, which has to resist severe conditions, like pressure and extreme temperatures. The propellants inside the chamber will burn at 5000 degrees Fahrenheit or even higher. At the same time hydrogen (at less than 100 degrees above zero) will move around via the channels on the outside. The inside wall is very thin. It is the part that should be very detailed (it consists of about 200 cooling channels). Moreover it should be able to resist extreme conditions. You see that it’s all difficult. The main part was produced with a selective laser melting 3D printer at Marshall’s Materials and Processing lab. FDM 3D printers are rather good for layering, whereas a selective laser melting 3D printer managed to mix 8255 layers of copper powder in 10 days and 18 hours. That’s quite a surprise. Not without reason did associate administrator for Space Technology Mission Directorate from NASA Steve Jurczyk call this part a milestone in the era of aerospace 3D printing. On NASA’s website he wrote that additive manufacturing is one of the great varieties of technologies that will help them make the journeys to Mars come true and more than that – support the explorers being on the planet. 3D printing has twice proved to be beneficial: it is both time and cost saving for creating such cooling channels with intricate designs. As you may have guessed, the ready detail had to go through a number of complex testing procedures since components for space industry have to be perfect. Some of the materials, parts and designs were tested in Alabama at the NASA’s Marshall Space Flight Center. To let gas circulate there are over 200 intricate channels between the outer and inner wall of the combustion chamber line. Chris Singer (director of the Engineering Directorate) confessed that it was a real challenge for the additive manufacturing team to make those tiny passages with complex internal structure. The engineer who worked through the manufacturing process, Zach Jones, explained that they used copper for this part as it is the most suitable material for this part as it conducts heat well. But such suitable properties for the majority of parts makes additive manufacturing of copper relatively difficult as it is difficult for the laser to melt the copper powder for a long time. Previously only some copper rocket parts have been 3D printed, so this time it’s quite a successful experiment. They’ve 3D printed the parts in GRCo-84 – copper alloy developed by NASA scientists from Glenn Research Centre, Cleveland, Ohio. It was a success, so the engineers are trying to create a wide database of properties of 3D printed rocket materials. The database is going to be opened for American companies in NASA’s materials and processing Information system, governed by Marshall. 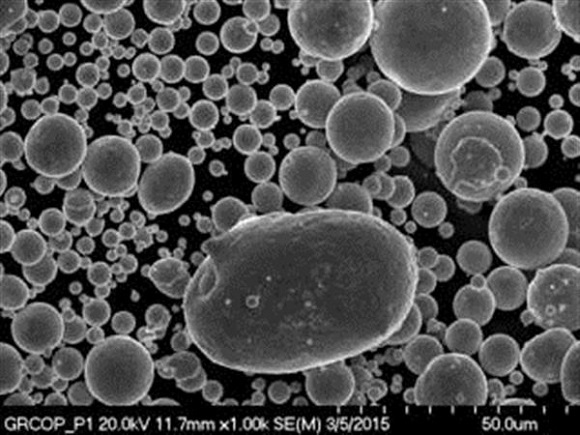 Electron microscope image of the copper particles used. The primary aim of the database and NASA’s experiments with 3D printing is to make building processes twice less expensive and to make the building processes 10 times quicker. They are not going to make just one part and stop with that. They are going to make it repeatable so that the whole industry could get used to manufacturing parts of engine. As the leader of the project Chris Protz said, the final aim is to make building rocket engines more reasonably priced. 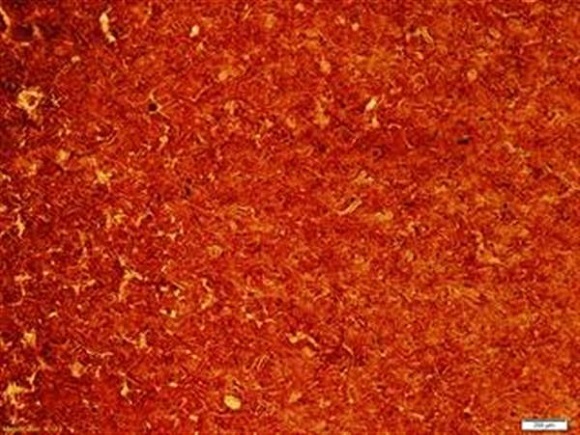 Microscope image of etched copper. 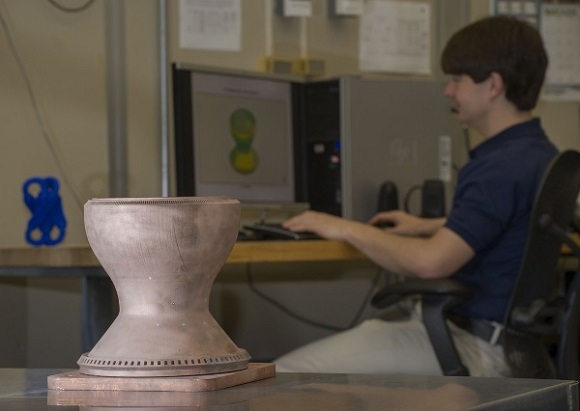 3D printing one copper part is the first step towards the new project by NASA – the Low Cost Upper Stage-Class Propulsion Project. It is the NASA’s Game Changing Development Program that funds the project, which is the first of the numerous attempts to change the future space travels, and the forthcoming journey to Mars. The further steps of the project include testing copper components to make sure that it will be able to withstand the circumstances and conditions. As soon as this stage is complete, other parts will be produced. Are 3D Printed Objects Toxic?